of Mechanical Engineering, Pontifícia Universidade Católica de Minas Gerais, Avenida Dom José Gaspar, 500 – Coração Eucarístico, Belo Horizonte – MG, 30535-901, Brazil 2 Departament of Physiotherapy, Universidade Federal de Minas Gerais, Av. Antônio Carlos, 6627, Pampulha – MG, 31270901, Brazil. 3 Department of Electrical Engineering, Universidade Federal de Juiz de Fora, Juiz de Fora- MG, 36036-900, Brazil. 4 Department of Mechanical Engineering, Universidade Federal de Minas Gerais, Av. Antô nio Carlos, 6627, Pampulha – MG, 31270-901, Brazil. *martinsjsr@gmail.com Abstract— The study of the human gait through the joints angles is an important branch of the biomechanics. The joints angles define the behavior of a segment in relation to another and, consequently, the overload on the tissues. The hip joint centre (HJC), regression equations system based on pelvic anatomy, is a parameter frequently used as reference point to determinate the hip and knee angles, therefore, is considered in the literature as an important factor in the kinemactics analysis of the human gait. Two analytical methods are recognized in the HJC estimation, the predictive method uses the difference between the anatomical points of the human body in the data collect, and the functional method uses a sphere adjustment approach. In the present research, it was used kinemactics data from seven volunteers, collected by Qualisys® system on a treadmill, and through algorithms developed in MATLAB®, the HJC were estimated by two predictive method systems (Bell and Davis) and one system of the functional method (with sphere adjustment approach based on the StarArc movement) and the joints angles which describes the flexion/extension movement of the hip and the knee were determined. 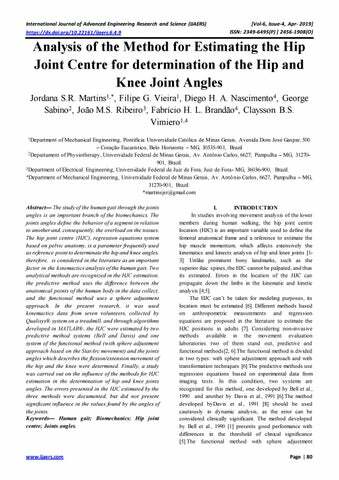 Finally, a study was carried out on the influence of the methods for HJC estimation in the determination of hip and knee joints angles. The errors presented in the HJC estimated by the three methods were documented, but did not present significant influence in the values found by the angles of the joints. Keywords— Human gait; Biomechanics; Hip joint centre; Joints angles. 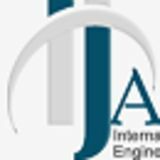 International Journal of Advanced Engineering Research and Science (IJAERS) https://dx.doi.org/10.22161/ijaers.6.4.9 approach was developed byGamage and Lasenby, 2002 , uses the StarArc movement, (combinationof the Star movement, 7 movementsof flexion/extension, abduction/adduction combinedofneutral position, and the Arc movement). When capturing the movement of volunteers during the walk using reflexive markers positioned in the bony protuberances, and estimating the HJC position, it is possible to draw a coordinate system for each segment in analysis, which represents the segments position over time. The Cardan method application allows the determination of a rotation matrix which represents the movement of one limb in relation to another dependent on the rotation sequence[10, 11]. In this way, the objective of this research is to compare different methodologies to determine the HJC, in order to estimate the variation that can be observed in different techniques. II. METHODS In an attempt to verify the influence of the location the HJC in kinematics analysis of the human gait of lower limbs, this research proposes the application of the prediction methods selected in different volunteers . The values obtained referring to HJC were used as reference points to the coordinate system of the thigh, simulating, through algorithms implemented in MATLAB®, the flexion/extension movement of hip and knee joints . We compare the joint positions of the HJC obtained by the three methods and verify the position difference in each one of the planes in each one of the methods . The kinematic data collection was approved by the ethic committee of Friedrich-Schiller- Universität Jena (0558-11/00). The clinical examination was carried out in the KIP-Labor of the Friedrich-SchillerUniversität Jena, Germany. All volunteers signed the consent form for the test. [12, 13] For the analysis of the movement of lower limbs, 20 reflexive markers were placed in the bony protuberances of the lower limbs, as specified by the International Society of Biomechanics (ISB) . The volunteers were subjected to a walk on a treadmill, with controlled speed of 4,5 Km/h. The two-dimensional data of the limbs were captured by 8 infrared cameras, processed and converted in three-dimensional through of the algorithms of the Qualisys system. To the collect, we calibrate the Y axis was calibrated as antero-posterior, X as mid-lateral and Z as proximal-distal. Participated in the study seven volunteers, with age range between 21 to 31 years old, corporal mass, height, body mass index (BMI), and variables PW (pelvic width), D (anterior- posterior component of the distance (mm) from the ASIS to HJC in the sagittal plane) and L(leg length), belongs to the Equations of preditives methods to the HJC estimation, are represented in Table 1.
centre and the ASIS). Method III, functional method system with sphere adjustment approach was used the system developed by Gamage and Lasenby (2002) , with performing of the StarArc movement. Where, m is the position vector of the hip jointcentre, rp is the radius of the sphere defined by p marks, M is the number of marks, p N is the number of frames and v k is the mark position p in the instant k [2, 4]. angles of the hip and knee were determined for each volunteer. Finally, the significance of the differences found between the methods and their respective angles was evaluated. III. RESULTS AND DISCUSSION Subject details with variables PW, D and L, measured through coordenates of the markers posicioned in bony protuberances are listed in Table 1. The Table 3presentstheHJC coordinates of the right leg in neutral position, by the three methods. The coordinatespresentedhaveas local reference the hip symmetry centre. Only the volunteers 1,2,3 and 7 performed the StarArc movement. to the other methods during the preliminary data phase was expected. However, even though deviations during the preliminary analysis would remit to a possible inconsistency during the simulation, the result did not diverge enough to discard the Method III. The mean values of the minimum and maximum amplitude of the angles of the knee flexion/extension movement for each voluntary, defined from the three HJC estimation methods, are represented in Table 5. LeardiniA, Cappozzo A, Catani F, Tokksvig-Larsen S, Petitto A, Sforza V, Cassanelli G (1999) Validation of a funcional method for the estimation of hip joint centre location. J. Biomech32:99-103. Davis RB, OunpuuS, Tyburski D, Gage JR (1991) A gait analysis data collection and reduction technique. Hum MovSci10:575-587. Gamage SSHU, Lasenby J (2002)New least squares solutions for estimating the average centre of rotation and the axis of rotation. J. Biomech35:87– 93. Baker R (2011) Globographicvisualisation of three dimensional joint angles. J. Biomech44:1885-1891. PhadkeV, Braman JP, Laprade RF, LudewingPM (2011) Comparison of glenohumeral motion using different rotation sequences. J. Biomech: Conf. Ser44:700-705. VIMIEIRO, C., ANDRADA,E., WITTE, H., PINOTTI, M., 2013. “A computational model for dynamic analysis of the human gait”. Computer Methods in Biomechanics and Biomedical Engineering, 2013  ANDRADA, E. 2007. “Functioal morphological model of the trunk in walking humans.Ilmenau (Germany), 238p. Biomechatronik, TechischeUniversatatIlmenau. Wu G, Siegler S, Allard P, Kirtley C, Leardini A, Rosenbaum D, Whittle M, D’Lima D, Cristofolini L, Witte H, Schmid O, Stokes I (2002) ISB recommendation on definitions of joint coordinate system of various joints for the reporting of human joint motion—parts I: ankle, hip, and spine. J.Biomech 35(4):543–548. Mann RA, Oakland MD, Hagy JORE (1980) Biomechanics of walking, running, and sprinting. Am J Sports Med 8:346-350.